The Snowball Series is a series of five races at five different, unique St. Louis landmark locations, each focusing on a different race distance. Join us for the full series while we tour areas of our beautiful city. Can't make it for all the races in the series? Sign up for individual races for only $23 in advance. 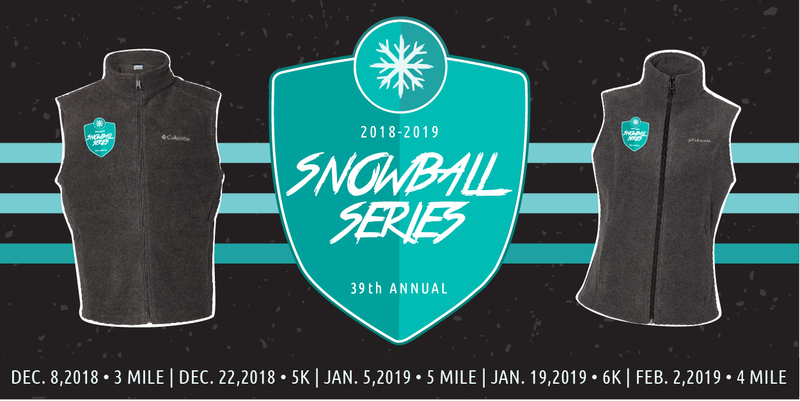 The series is designed to encourage you through the three coldest months of the year while promoting health, fitness, and fun for all people of all ages and abilities. Come as you are, bring some friends, and join our Winter running family. New this year, series participants will receive a unique snowflake finisher medal for each series race. Each series medal features a custom interlocking design that fit together to create a single master medal that depicts a large snowflake! Weather Update (posted 1/18 @ 8:00pm): It is with much difficulty that we have decided to cancel our 1/19 Snowball Series event at Creve Coeur Park. The weather forecast is ominous and the safety of our participants and volunteers is our highest priority. If you are pre-registered for this race, keep an eye on your email this evening for further details. We appreciate your understanding and wish you all a safe and happy weekend! South end of Creve Coeur Mill Rd is closed. Access to CCP Soccer Complex is available from Hwy 141. Series Swag | Series participants will receive a gender-specific Columbia Fleece Vest featuring an embroidered Snowball Series logo on the right chest. A plush layering piece designed to keep your core warm is as durable as it is soft. The vest, made of 100% polyester MTR filament fleece, is made for multi-climate activity and features zippered hand pockets. Click here for sizing chart. Interested in one of the individual race swag items? Series registrants can add on swag items at a discounted rate during registration! Register for the series through 11/30 to guarantee your vest is available for pickup on the first race on 12/8. If registering after 11/30, your vest will be available at the 3rd race on 1/5 or after. BOCO Performance Mesh Beanie | Considered BOCO's most versatile beanie, this three seasons lightweight performance cap has a perfect warmth to weight ratio. The beanie features a brushed stretch polyester outer shell, a performance knit polyester inside to enhance wicking performance by moving moisture quickly to keep you comfortable throughout your workout. It fits under helmets and is machine washable. BOCO Converter Gloves | This will be your go-to piece in your bag all winter long! The medium-weight converter gloves feature stretch, weatherproof fabric that converts the glove into a mitten or tucks away into the back of the hand. The glove's palm features snowflake silicon logos for added grip, and touch screen enabled material on the thumb and index finger. Glove Sizing Chart. Brooks Pacesetter Cushion Crew Socks | This midweight sock by Brooks Running features DriLayer yarn for quick-drying, designed to prevent slipping, targeted arch compression, and smooth toe seams to reduce irritation and provide the perfect fit. Socks available in sizes small, medium, and large. Gender-Specific Columbia Fleece Vest | Individual race participants can also choose to add on a gender-specific Columbia Fleece Vest featuring an embroidered Snowball Series logo on the left chest during registration. Series Finisher Medals | New for 2018-2019, series participants will receive a unique snowflake finisher medal for each series race. Each series medals features a custom interlocking design that fits together to create a single master medal that depicts a large snowflake! Medals only available for series participants. Series Scoring | To earn series points and be eligible for the series standings, you must be registered for the entire series and finish 3 of the 5 races. Each series participant’s 4 best scores will determine their final standing. Age groups are 19 & under, 20-29, 30-39, 40-49, 50-59, 60-69, 70+. The age of series participants on 12/9/2017 will determine their age group. Points will be awarded based on age group placement: 1st – 50 points, 2nd – 45 points, 3rd – 40 points, 4th – 35 points, 5th – 30 points, 6th – 25 points, 7th – 20 points, 8th – 15 points, 9th – 10 points. All remaining finishers receive 5 points. Individual race awards will be given to the top 3 male and female overall and the top 3 male and female finishers in each age group. Individual Race Awards | Awards will be given to the top male/female overall & top three males/females in the following age groups: 19 & under, 20-29, 30-39, 40-49, 50-59, 60-69, 70+. Series Awards | Top three males/females in the following age groups: 19 & under, 20-29, 30-39, 40-49, 50-59, 60-69, 70+. To be eligible for series awards, entrants must participate in 3 races, and the best 4 will count towards individual series awards. Personalized Race Bib | Series participants who register by 11/23 will received a personalized race bib with their names or nickname printed on the front of the bib. Volunteers | Interested in volunteering for the series or individual races? Volunteer for 3 or more series races and receive a gender-specific Columbia Fleece Vest. Individual race volunteers will receive a choice from BOCO Performance Mesh Beanie, BOCO converter gloves, or Brooks crew socks. Contact Jules (jules@fleetfeetstlouis.com) for more information. Sponsors | Your partnership dollars will provide you with increased corporate and brand visibility while making a direct and meaningful impact in the lives of many in the St. Louis and surrounding areas. By sponsoring the Snowball Series, you receive many benefits (commensurate with sponsor level) including but not limited to: inclusion on the webpage on ffstl.com, print media advertising, marketing upon our social media platforms, complementary series entries, promotional material in Fleet Feet stores and customer bags, and more! For more information email Jules (jules@fleetfeetstlouis.com) or view the sponsorship packet. Refund and Transfer Policy | No refund within 14 days of an event. No make-up date or refunds will be given if the event is canceled due to weather. Entries are not transferable to another event but can be transferred to another participant. Dogs are not allowed on course or allowed to participate in the races. Inclement Weather Policy: The safety of our participants and volunteers is our highest priority. If severe weather is present, we will post an update on the Facebook Event Page and at the top of this page by 6:30 am the morning of the event at the latest.